This help series is designed to assist therapists and parents to provide functionally designed handling activities that can be incorporated into the daily care routine of the infant and young child to improve developmental skills. 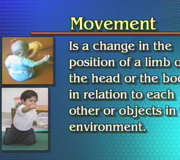 Each activity is demonstrated on a doll for clarity, intermixed with application to children with neuromotor problems, with discussion of the purpose of the activity. Introduction to Helping the Physically Challenged Child Function More Independently provides an overview to the series and addresses developmental concerns, positional concepts, how to begin and coping with common problems.